This brown rice khichdi is a bowl of comfort and nutrition. A one pot meal with brown rice, lentils and vegetables for that easy weekday dinner that is quick, tasty and healthy. This brown rice khichdi recipe is a blast from the past. It was first published in my weekly Indian Express recipe column. Because of continuous travel, which is expected to last for another month or so, I haven’t been able to find my rhythm of creating and writing. But khichdi is a favourite dinner meal for both of us and when I came to my mom’s home last night, a bowl of warm moong dal khichdi is what I was craving for, which made it perfect for sharing today. 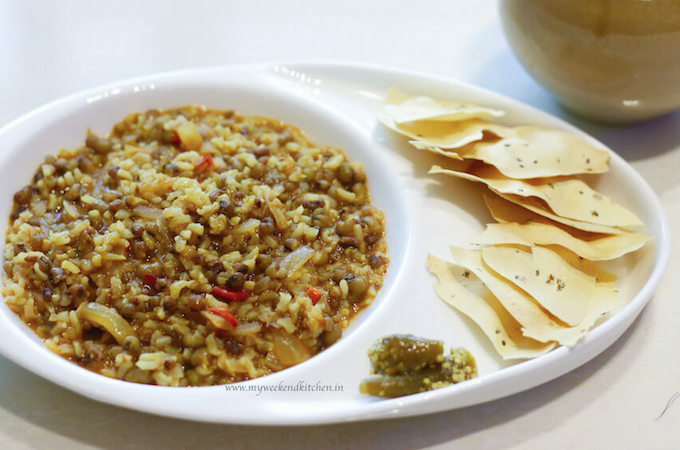 At the core of it, khichdi is a simple rice and lentil casserole but given the variety of lentils and rice that we have in India, no two households will be making the same khichdi recipe. On top of it, the veggies and the spices added to khichdi vary from one cook to another. That is exactly why I can make it so often and still not serve the same meal! Sometimes it is with yellow moong dal and white rice and sometimes it is with many different grains. In this brown rice khichdi recipe I have used two kinds of whole lentils — green moong beans and brown moth beans. Not only is this brown rice and lentil casserole full of happy nutrients and lots of fibre, it has a rich earthy and rustic taste. Earthy, rustic and very flavourful, this brown rice khichdi is a comfort food. Brown rice, whole lentils & vegetables come together in a healthy hearty one-pot meal. Wash the rice and lentils under running water. Soak in 3 cups of hot water for 30 minutes. Heat oil in a pressure cooker. Add asafoetida and cumin seeds. When the seeds start to crackle, add chopped onions. Sauté the onion for a minute. Add chopped ginger, garlic and chillies to the onions. Sauté for 5 mins. Remove from heat and let the steam escape on its own before opening the cooker. Serve hot with some papads and pickle. Both brown rice and lentils are high in proteins and carbohydrates. You can increase the nutrition by adding some more vegetables like carrots, broccoli, and sweet potato. 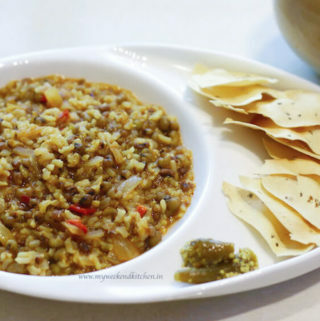 Since both the rice and lentils are used with their skin, the recipe is rich in fibre. The high fibre content is great news for bowel function and digestion. Eating whole grains like brown rice and whole lentils not only helps in reducing weight it also prevents gaining more weight. We all know lentils are a rich source of protein, but so in brown rice. One cup of brown rice has 15g of protein as opposed to 4.2g in white rice! Try switching white rice with brown rice and other varieties like red and wild rice in different rice recipes and you will see a difference in your health. Did you make this recipe? You have to try it for the rustic and earthy flavours of Indian cuisine! Send me a question, a picture, leave a comment or connect with me on Facebook, Twitter, Google+, Pinterest and Instagram. Would love to start a conversation, share recipes, cooking experiences and food stories from India and around the world. Thank you so much for all your love and encouragement Rani!! 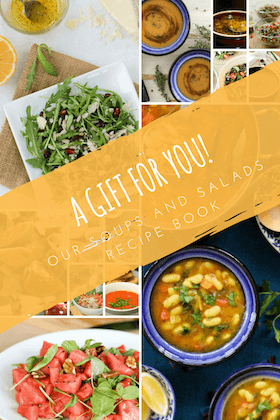 This is what motivates me to keep learning, exploring and sharing recipes!